One of our biggest challenges on Starry Horizons is preparing the boat to be a world traveler. On past travels to Europe, being prepared meant buying a few adaptors so you could still plug in your phone and laptop. But things are never that simple on boats. Not by a longshot. Here, as briefly and clearly as I can put it, is the challenge we face. 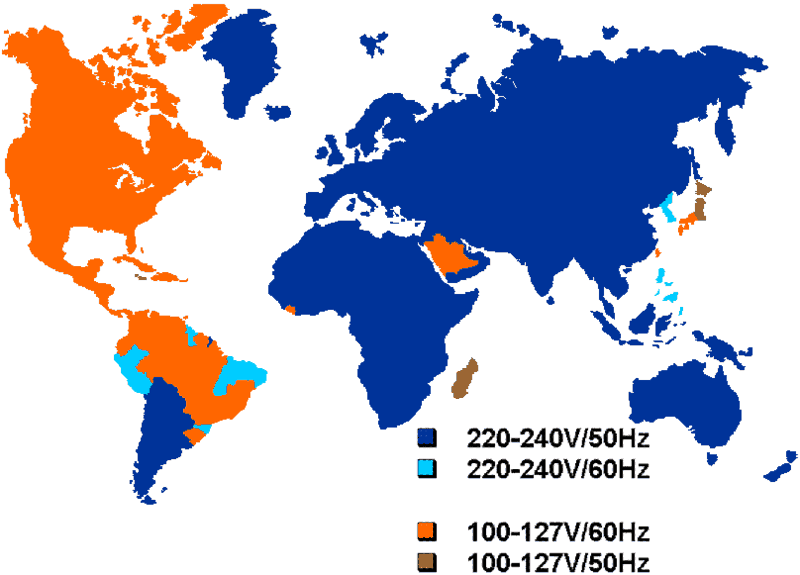 Electricity throughout the world is generally set up using two different power systems, a 110v(volt)/60hz (hertz) system which is common in North America/parts of South America and what is used in the United States, and a 220v/50hz system which is fairly common throughout the rest of the world. Fountaine Pajot offers to set up the boat using either system, and since we are based in the US and plan to return to the US once our travels are over, we elected for the 110v/60hz option. The trouble comes in figuring out what do do when we are in countries that are shaded blue in the above map. Our onboard generator will be sufficient to provide power for air conditioning and other AC (alternating current) systems whenever we are at anchor. However, when we are staying in a marina, we don’t want to run the generator all the time and be “those people” who annoy everyone else around them, in addition to putting a ton of hours on the generator. Staying in a 110v/60hz marina won’t be a problem as we can just plug directly into shore power, however setting the boat up to be able to operate on shore power when we’re in a marina that has a 220v/50hz power system is the real challenge. In my research and in talking with our dealer, I understand that previous boats addressed this issue by buying “dual cycle” air con units that could operate on both 50hz and 60hz and then would use an isolation transformer to “step down” the voltage from 220v to 110v and thus would allow the air conditioners to work. However, apparently the marine air conditioning manufacturers no longer offer these types of units. So, as I understand it, these are our current options. Go without air conditioning in a 220v/50hz marina. While I’ve been told the installation of the exhaust of the generator is done in such a way to keep the generator very quiet, I still don’t really like the thought of continually running the generator 24/7 when in a marina. Install an isolation transformer that can “step down” to 110v and run the 60hz air conditioners on 50hz. Combine a battery charger that can accept both cycles with a large inverter to power some/all of the air cons on board. Our dealer has advised that the reaction time between the inverter and battery charger wouldn’t be quick enough as the battery charge would constantly be lagging behind the inverter. Install a “shore power converter” that would convert both voltage and cycles. I’ve also seen these referred to as frequency converters or voltage conditioners. This is a very expensive option, and getting one large enough for our needs would be quite heavy and take up a lot of room on the boat. Given my finance background, I feel like I’m well qualified to work through all these issues. But I’ve been fortunate in that Paul at our dealer has been very knowledgable (and patient!) helping me work through these issues, and several other people have been willing to help me sort through these issues as well. Right now I’m leaning towards a shore power converter as that would be the “true” way to set up the boat to handle everything and would theoretically make things as “plug and play” as possible. Like all things boat related, I reserve the right to change my mind at some later date. Hey Guys, I know I’m digging up a pretty old post here but I’m curious to know what you ended up doing to solve this problem. I have been racking my brain trying to figure out what makes the most sense. I’ve been thinking lately that I might just wire a separate 240/50hz AC distribution to a few plugs only, branching it off the input side of a isolation transformer to run a portable AC unit and vent it. This would allow for a PAL TV etc when staying in a Marina over the winter. Fair winds! We did end up going with the shore power converter that takes 240v/50hz power and converts it to 110v/60hz. But I wouldn’t do it again. It’s expensive, heavy, we so rarely go into marinas and even when we do, we don’t always hook up to shore power. A lot of the equipment on the boat would likely run fine at 50hz, including TVs, laptops ad most modern electronics. And as it turns out, even our CruisAir (Dometic) air conditioners are labeled that they’re “derated” at 50hz, but they will still run. Off the top of my head, I’d think a microwave would be most sensitive to the voltage change. If I were doing this all over again for our cruising agenda, I’d go for the step down transformer to bring the voltage down to 110v and just live with being plugged in to 50hz power. It’d be a lot simpler, and cheaper, to buy a new microwave (or portable AC unit if you really want) if you’re staying in a marina all winter. Now, if you’re planning on returning to the same location winter after winter, then I’d say you’d probably be better off going for a 240v/50hz boat. Thanks for sharing that link Price. I finally got a chance to read through the whole thing and I think it is a pretty good summary of the options available. However, it doesn’t discuss “shore power converters” which is what we’re looking at, and it doesn’t explicitly mention that Isolation Transformers won’t take a 50hz input and change it to a 60hz output. That issue seems to be the biggest one as the air con units in the Helia aren’t rated to run at 50hz and thus, as he discusses, will likely result in a shorter lifespan if run on 50hz. We’ll probably end up with a shore power converter that will be sized smaller than would be required to run the full boat, as we’d be happy to be able to run a couple of air cons and charge the batteries while we’re at the dock. This should work for us since we don’t plan on spending a large amount of time in a marina, but we do want some comfort while we’re there. Here is a link to an interesting discussion on this topic. “Cruisers are accustomed to developing DC energy budgets, as this is where we begin when determining the size of our DC house bank(s) and, subsequently, the capacity of our DC charging systems. But we tend not to be so diligent about AC demands, usually finding enough AC power at our homeport dock to meet our needs. This is less true in Europe where the typical maximum AC power from a single dock power stand outlet will be 16 amps @ 230V.” It seems to me that this may place a practical limit on the useable output of your transformer, regardless of it’s theoretical capacity. The implication being that you will have to be selective about what you plan to run. This will obviously have an impact on the size of transformer you will actually need. Just a thought. P.
we will be facing the same issue and i have be pondering this myself. I will be very interested to hear what you decide to do. your description of a shore power converter says it is “big” and “expensive”. do you have an idea of how big it is and what it costs? Thanks, Price. Hi Price. What my dealer and I are currently looking at as a solution is to get a 5Kva shore power converter, which would be large enough to run some air cons on the boat, but likely not all at once. This would be a decent compromise for us as we don’t intend on spending a lot of time in a marina if we can avoid it. Those units are approximately $9k+, with install probably another $1.5-2k. Not quite sure on actual dimensions, but they can weigh upwards of 250 lbs.